ESPN is devoting what seems like the entire 60 minutes of Sports Center each night to the legend of Denver’s new darling. 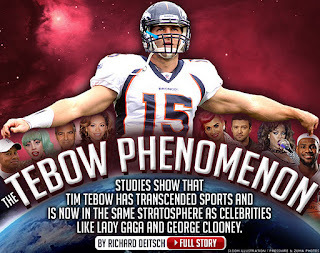 Sports Illustrated says Tim Tebow has transcended sports and is now “in the same stratosphere as Lady Gaga.” The Denver Post said that business management styles will change because bosses will realize they should be kinder and more respectful, like Tebow. Enough. Uncle. I need a Tebow time out. All this wholesome pep rally talk is giving me the creeps. What happened to jocks getting caught with hookers or pot? I am nostalgic for the days when we could talk about athletes shooting themselves in bars or testing positive for steroids. Stop the bandwagon, I’m jumping off. Colorado is gaga for Tebow. It used to be Elway’s town, where everyone bought cars from his dealerships just to have his name on the back of their vehicles. Now Denver belongs to Tebow and it doesn’t matter if he can’t pass or read defenses or if he spends the first 58 minutes of the game looking lost and confused. Tebow’s brand works because he eats, prays and loves everyone with a big smile on his face, even the opponents who want to rip his head off and feed it to the cat. His brand promises magic and so far, he’s been able to deliver week after week. He oozes positive thinking and people are impressed with his All American boy authenticity. In PR terms, Tebow is doing what every Denver public relations pro counsels clients to do. He lives and breathes his brand. He delivers on his brand promise. He stays on message. He accentuates the positive, eliminates the negative, and lets his agent deal with anything in between. I can appreciate his PR savvy and his sincerity, but his brand is already overexposed and it gets worse every day. Fans are putting him way above a pedestal; they are putting him on a throne. Even strong brands have trouble living up to such expectations. Just ask John Elway, LeBron James or Barak Obama. Sometimes even Apple disappoints. So my advice for Tebow would be enjoy the ride and hope for a nice soft landing. Now if anyone needs to reach me I’ll be in a Tebow Time Out. Agreed, and I'm not even in Denver or on ESPN all the time, and I'm feeling the burnout. Seems everyone is trying to find SOME way to work his name into a headline. Overexposure has some PR downsides, not the least of which is that big figures make bigger, easy targets. FWIW.